The Whisky Virgin’s head is spinning this month, but not because of over-indulgence. Instead, our clueless ingenu has finally visited a distillery – not in a Scottish glen, but in a former glue factory in East London where the c-word (craft) hangs heavy in the air. What’s up, fellow whisky chasers? I’m writing to you this week with a head full of wonder because I’ve managed to organise myself a trip to a real live whisky distillery. While I’m there I hope to get answers to my most whisky virginy questions. I mean, where does whisky come from? How do you do whisky? I know it has something to do with carefully heating a sort of beer, but as for the particulars, I’m kind of in the dark. The best part about my latest voyage of discovery? I don’t have to trek all the way to Scotland to see how the whisky sausage is made – in fact, I don’t even have to leave London. It turns out that new-school spirit makers the world over are installing stills in old industrial units, far from the whisky heartlands, and trying their hand at making the mother of all boozes. The name being given to this new trend in micro-distilling? Craft. I’ve heard of craft beer, I’ve heard of the 1996 teen witch movie The Craft, but craft whisky? What a time to be alive. And so I head to the land of the seven-quid pint, Moustache Town, the cradle of the breakfast rave – I speak, of course, of East London. My destination: a former glue factory that now acts as the base for maverick booze wizards the East London Liquor Company (ELLC). Established in 2014 by drinks industry veteran Alex Wolpert, this crew started out doing what a lot of new crafty alco-artists do to get established: redistilling sourced alcohol to make vodka and gin. Their clear spirits can now be found across the UK, they’ve made partnerships with global distilleries to sell their rum and Bourbon, and now they’re getting ready to launch their first whisky. When the ELLC’s trademarked London Rye eventually drops, it will be one of the first whiskies produced in the capital for 100 years. I have to admit, however, that this ‘craft’ business does make me a little nervous. I once asked for a lager in a hip beer pub, and the bartender made fun of my shoes and haircut before bullying me into buying a Marmite-thick, quadruple-smoked IPA. Ever since then, I have been suspicious of ‘craft’ anything. Will these hot young spirit slingers be making ‘whisky’ out of kale and beard oil, and perhaps a third millennial stereotype commodity? I’m here to find out. When I arrive at the distillery and see the handsome copper stills behind glass, I struggle to play it cool. I don’t want these ruthlessly hip East Londoners to sniff out what a big whisky virgin I am. The good folks of the ELLC are happy to oblige. They tell me that their whisky journey started at the nearby Crate Brewery, where the ELLC distillers put together their first rye wash for distilling. This specially brewed pre-whisky was then put through a big pot still to extract its sweet-sweet alcohol, before going through a second round in smaller stills to turn it into spirit. From there, the fruit of the ELLC’s beardy labour is filled into casks, where it stays for at least the three years it takes to become whisky in the eyes of the law. 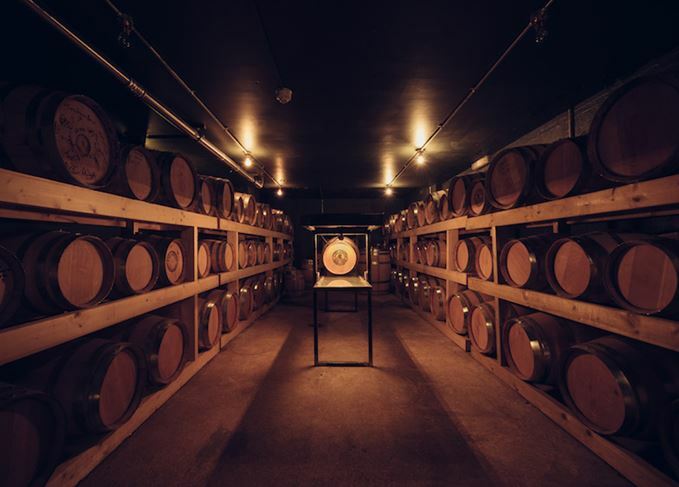 The casks in the tiny basement/tasting room come mostly from Bay Area Bourbonistas, Sonoma County Distilling Co, but some are made of chestnut, some previously contained wine, and some are so secret that I’m not even allowed to know what they are. After barely an hour in this temple of liquor, I feel like I understand my favourite tipple in a whole new way. Seems to me that one of the great things about the spread of small-scale distilling is that people like me have the chance to visit distilleries and get woke to how they do their thing. As for my reservations about this ‘craft’ business, at no point during my time at ELLC does anyone actually use that word. I also don’t hear anything described as ‘artisanal’. They do serve thin-crust pizzas on site, and lots of the people working here seem to be sporting ink, but this outfit is clearly not built on hipsterist poseury. I get the sense that the whole team is fired-up about making the best boozes they can. To that end, there’s a whole lot of experimenting going on in this here whisky shack. These young iconoclasts are tinkering with their recipes, they’ve started to make their own wash in-house from English rye, and to use different types of yeast in the process. They’re sourcing barrels from all around the world and cooking up new grains with a view to making different types of whisky. There might even be a single malt on the cards. But, for now, it’s ELLC rye we have to look forward to. When I ask for a sample of London Rye, I’m told that there’s none to be had, as it just isn’t ready quite yet. I choke back my disappointment and wash it away with a sip of the house dry gin. Seems I’ll have to wait just a little longer to let you know how hipster hooch tastes. With my time at the ELLC coming to a close, I’m ready to think about this month’s white-hot whisky takes. So I got to see my little face reflected all distorted in polished copper stills and to have a good old stroke of some oak barrels with baby whisky sleeping inside. It was educational, and I’d highly recommend getting yourself to a micro-distillery in a town near you. If there isn’t one in a town near you yet, I have a feeling there will be soon. What start-ups like this one prove is that, with the right attitude and the right crew, you can make whisky anywhere. Makes sense really; it’s not like they mine it out of the hills in Scotland. Will London Rye be worthy of its place on the shelf with old man Scotch and sweet aunty Bourbon? Time will tell. What I can say for now is that the crew of the East London Liquor Company have the look of people who know they’re working on something good. What has driving a handbuilt wooden car around Goodwood race track have to do with whisky? The chef has partnered with the Scotch whisky brand to explore the ‘true meaning of craftsmanship’.